Our anniversary year is over. 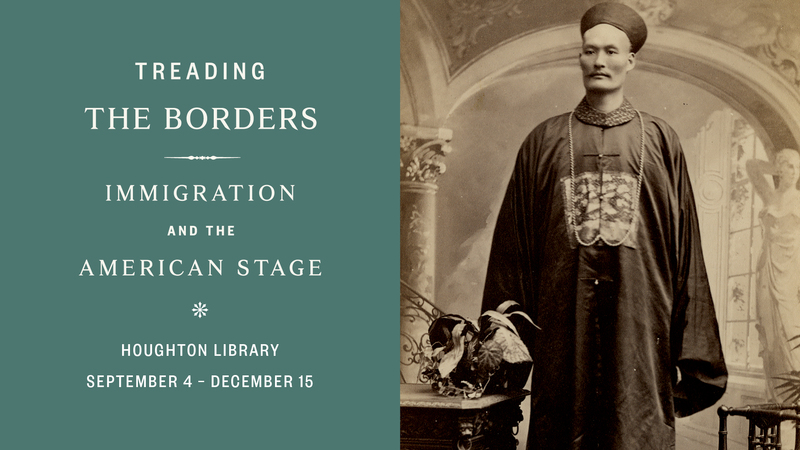 For up to date details on Houghton Library, go to our main website. Much of the richness and vitality of the performing arts in the United States derives from creative talent originating elsewhere. 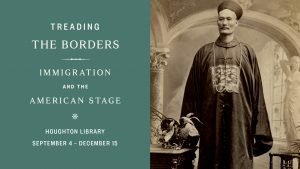 This exhibition looks at how successive waves of immigrant performers—Irish, German, Italian, Chinese, Russian, Puerto Rican, and more—have enlivened the American stage from the colonial era to Hamilton. Revered as the “father of American ballet,” George Balanchine (1904-1983) emigrated from the newly formed Soviet Union via Western Europe to the United States, where he founded the New York City Ballet and lived until his death. 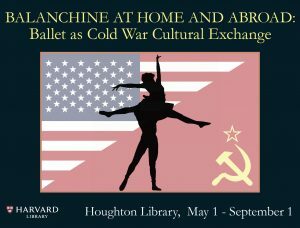 Drawing on Houghton Library’s George Balanchine Archive, “Balanchine at Home and Abroad” highlights the most vibrant and exciting souvenir programs from performances by Balanchine’s New York City Ballet in the Soviet Union, and the Bolshoi and Kirov Ballets’ visits to the U.S. in the 1960s and 1970s. 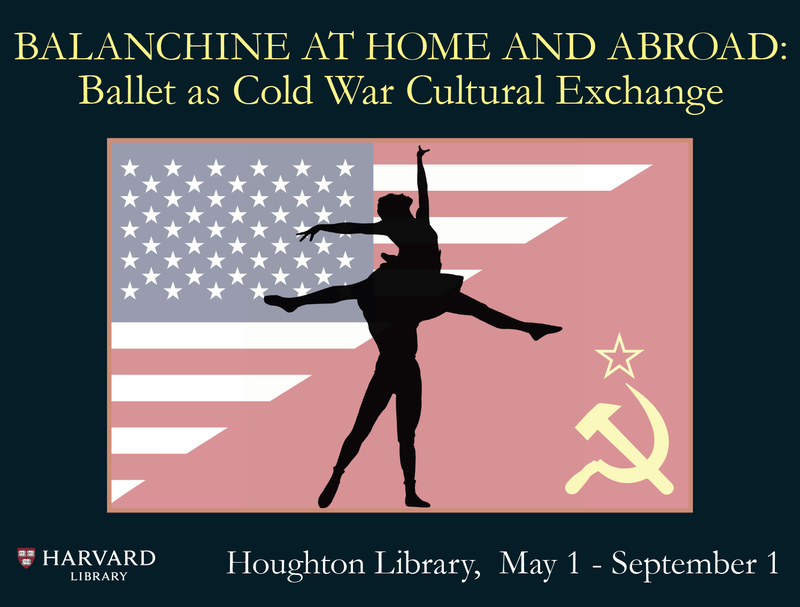 It also examines Balanchine’s return to the Soviet Union almost forty years after his emigration, underscoring the significance of his Russian-Georgian-Soviet heritage his role of American Cold War cultural ambassador. This exhibition was guest curated by Megan Race, Ph.D. Candidate, Department of Slavic Languages and Literatures, Yale University, and Houghton Library Visiting Fellow/Howard D. Rothschild Fellowship in Dance 2017-2018. Ostraca (singular: ostracon) are pieces of broken pottery or limestone flakes used to record writing in ancient Egypt. Much cheaper than papyrus, they were used as abundantly as our modern day Post-it note. This exhibition highlights Houghton Library’s collection of ostraca discovered on the island of Elephantine in southern Egypt, including receipts, records of goods, taxes, and personal letters written in Demotic, Coptic and Greek. These “ancient Post-its” not only preserve information about daily life on Elephantine, but also show us the island’s uniqueness as a multicultural society. This exhibition was guest curated by Andréa Martinez, Julia Puglisi and Hilo Sugita, all students in the department of Near Eastern Languages and Civilizations, together with and under the guidance of Prof. Dr. Verena Lepper, Principal Investigator of the ERC-Starting Grant Project ELEPHANTINE, and Curator for Egyptian and Oriental Papyri at the Ägyptisches Museum und Papyrussammlung, Staatliche Museen zu Berlin - Preußischer Kulturbesitz, and Houghton Library Visiting Fellow/Joan Nordell Fellow 2017-2018. 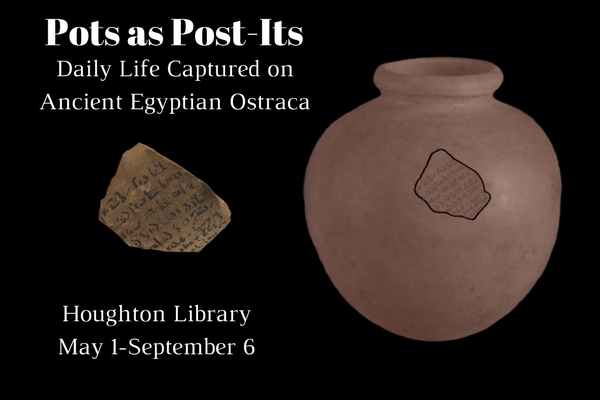 Visit https://houghtonostraca.weebly.com/ to watch a video on the history of Elephantine island and interact with 3D models of Houghton Library’s ostraca collection. 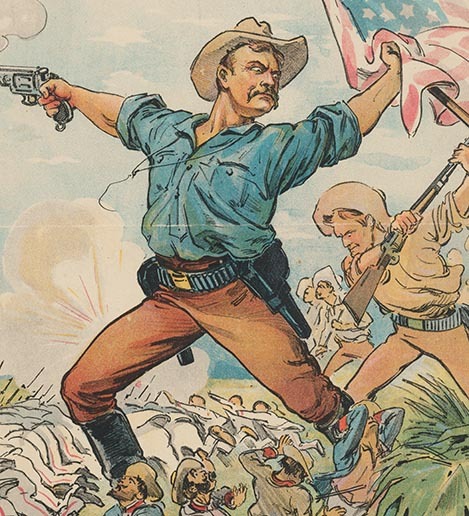 Through political cartoons from Houghton Library’s Theodore Roosevelt Collection, this exhibition examines the Spanish-American War and its role as the start of the United States as a world power. The exhibition was curated by Houghton Library 75th Anniversary Undergraduate Fellow and history concentrator Arthur Schott-Lopes ’19. It is free and open to the public. The Theodore Roosevelt Gallery is located next door to Houghton in Lamont Library, Lower Level (enter through the West Door). For a wheelchair-accessible entrance, please use Lamont Library’s main door and take the elevator to level B.